I have lawns; I have bowers. 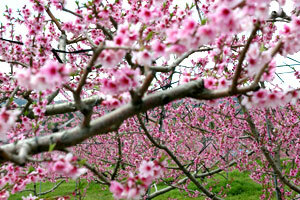 I have fruits; I have flowers. Here's God speed the plough. Pick-Your-Own Fruits & Vegetables ! CLICK HERE ! We specialize in Angus cattle, natural pasture raised beef and a variety of pick-your-own fruits and vegetables throughout the seasons. 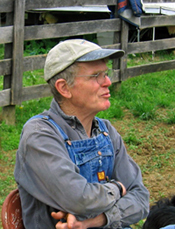 Hollin Farms was started by the late Robert C. Davenport in the early 1950s. The farm is named after Hollin Hills, an award-winning community of modern houses that he developed in Fairfax county in the 1950s and 60s. 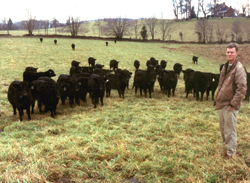 At Hollin he focused on performance testing bulls, and over 50 years developed an outstanding purebred Angus herd, selling bulls to mainly commercial cattle operations. 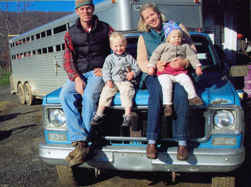 He was awarded the Virginia Cattleman of the Year award for his efforts at improving beef cattle in Virginia. See Hollin Farms videos on YouTube. Matt Davenport has a Master of Engineering degree in Agricultural and Biological Engineering from Cornell University. He manages the day to day operations of the farm. Matt and Shannon were the recipients of the "Young Farmer Achievement Award" for the state of Virginia from the Virginia Farm Bureau. Tom grew up on the farm and has been a filmmaker for most of his life, best known for making a number of films on American folklore subjects and a series of adaptations of folktales called From the Brothers Grimm. He has developed folkstreams.net to video stream documentaries on American roots cultures. Mimi Davenport, (wife of Tom, mother of Matt) in farm wife tradition, runs the office, keeps the books and does the billing. She is also the master of this website.